140ml/5oz Stainless Steel Milk Jug. 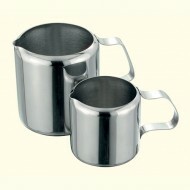 (shown in..
280ml/10oz Stainless Steel Milk Jug. (shown b.. Stylish Nouveau high quality Milk Jug. 350ml ..
Premier 14.5cm Milk Jug ..